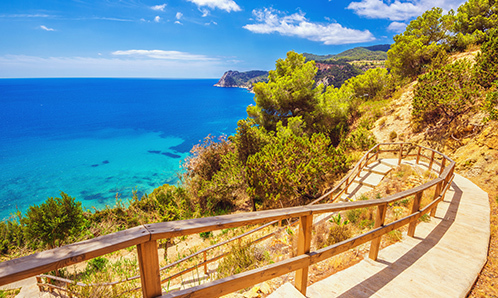 A vast country with a rich history, Spain offers an exotic atmosphere in the heart of Europe. 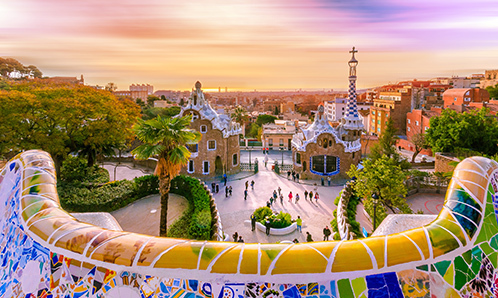 Whether you’re attracted to the cultural heritage of larger cities like Barcelona or Madrid, or prefer basking on the country’s most beautiful beaches, Spain is a tourist destination that will charm any traveler. In the evening tapas style restaurants and flamenco rhythms will seduce you after a long day spent discovering the country’s fascinating architecture styles and museums. To make sure that you don’t miss anything, our travel agents have compiled their favorites to help you get ready for your holiday in Spain. Although Spain is in Europe, you will recognize many cultural traits that the country left to its former American colonies, namely Mexico, Cuba and Nicaragua. 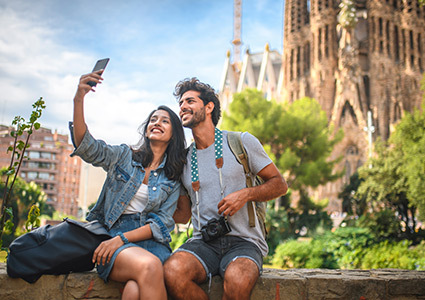 Its exotic flair can be seen in Gaudí’s remarkable architecture, as well as in the country’s carnivals and popular celebrations, which gather crowds of people who come for the fiesta. Spain has no shortage of wonders. 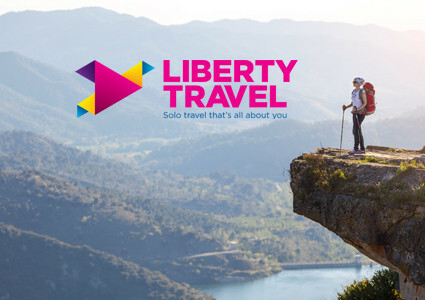 From basking on the beaches of Costa Brava to partying in Ibiza, to walking El Camino de Santiago - Spain’s famous pilgrimage trail, or hiking the Sierra Nevada’s regional park, the possibilities are endless. In Spain, you will have to adjust to a different rhythm of life: lunch is served at 1pm, dinner at around 10 pm, and it’s not uncommon for local businesses to close during the afternoon siesta. You could take a nap as well! This way, you’ll have more energy to enjoy the various cultural events and festivities offered in this country. 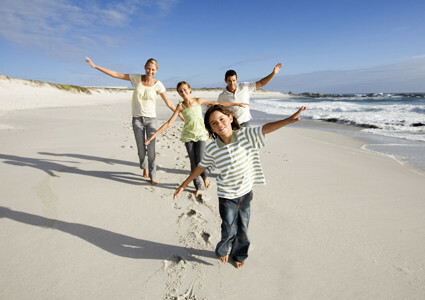 Expressive and lively, Spaniards enjoy spending time with their family and friends. It’s not easy to choose among all of Spain’s carnivals and fiestas. Do not miss the Tomatina, a popular celebration, which takes place in August in the city of Buñol, where people throw tomatoes at each other. For a less messy choice, the Seville Fair takes place in April and features dance and music shows for a week. Every moment spent in Spain will be marked by a delicious meal. Spaniards truly love eating and sharing! You’ll find a real feast on every table! In the cities, in Andalusia or on the beaches of Costa del Sol, you will have the chance to taste some of the most perfectly prepared fish, meat, and vegetable dishes, which will satisfy every taste. Spain is a vast country, so prepare yourself well for this trip to make sure that you won’t miss a thing. Madrid has become a master in the art of fiesta. After 38 years of dictatorship, the capital is making up for lost time with an active nightlife, exquisite gourmet restaurants and tapas bars, as well as fabulous museums. Spain has four official languages spoken across the country’s regions: Spanish (also called Castilian), Catalan, Galician, and Basque. Spanish is spoken by 95% of the population, remains the country’s most widespread language. 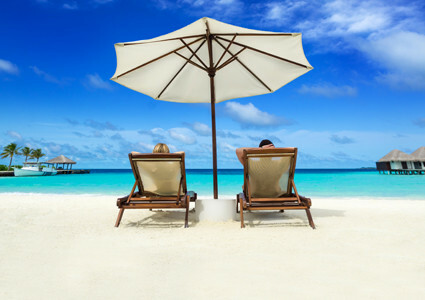 To avoid crowds, it is recommended to visit Spain in April, May, September or October, where temperatures are pleasant. However, the weather in the North can be a bit chilly at night, especially in the mountains. The climate in Spain is typically tempered and dry; but it is characterized by extreme changes in temperature from one area to the next, depending if you’re next to the sea or in the mountains: the Atlantic coast enjoys a mild climate even in summertime, while temperatures in Madrid and in the South can reach 40°C throughout the month of July. 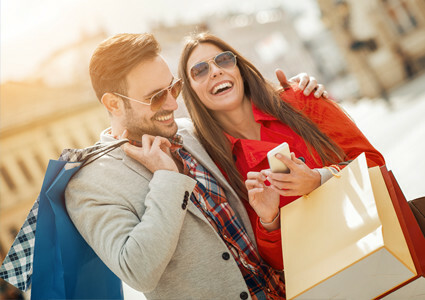 It is recommended to ask your travel agent for advice depending on the places that you plan on visiting. Like most members of the European Union, Spain uses the Euro as its currency. Credit card payments are generally accepted in hotels, restaurants, and local businesses. So no need to bring too much cash with you. Voltage in Spain runs at 230 volts and plugs have two round pins. Don’t forget to pack your adaptor! You can call all over the world from Spain. Internet and Wi-Fi are widespread and often free in hotels, restaurants, and public areas. Many flights leave from Canada to Madrid, Barcelona and Málaga. You will have no difficulty finding flights for Spain. If you visit Spain in the summer, plan for light clothing since it will be sunny and hot. During the other seasons, pack some sweaters and pants in your suitcase, as temperatures will get cooler. An elegant attire will come in handy if you wish to enjoy the nightlife or dinner at a nice restaurant. Make sure you always bring comfortable shoes since Spain is a country best explored on foot. Spanish cuisine is unique in that it offers fresh ingredients with almost no processing or transformation. Each region has its own specialties and Madrid gathers more than 150 starred restaurants, which would make Paris pale with envy. Paella: Served in a large pan, this emblematic Spanish dish is named after the frying pan where it’s cooked. Combining rice, meats, and seafood, paella is available in several variants based on the region where it’s prepared. Cocido: Served as a main dish, this stew is made with vegetables, meat and legumes cooked in a tasty broth. It’s the real definition of comfort food. Churros: The ultimate Spanish pastries, the churros are made with fried batter covered with sugar before being coated in melted chocolate. A real delicacy! Cerveza: In Spain, every, or virtually every region has its own beer. Enjoy a San Miguel, the country’s most consumed beer. Wines: Spain produces excellent wines, including those from the Rioja or Castile and León region. Horchata: Made from tigernut, a perennial plant, this refreshing alcoholic beverage is mostly enjoyed in the summer. When eating at a restaurant, service is included in the bill, but it is common for customers to leave a 5% tip when they’re satisfied. 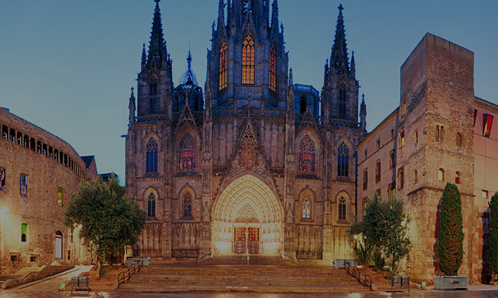 Set right where mountain foothills meet Mediterranean shores, Barcelona will charm you with its energy and culture. Take some time to discover the works of renowned artist Gaudí in this city famed for its art and architecture. Visit the Sagrada Familia, Casa Batlló, and La Pedrera, and immerse yourself in Gaudí’s world. The Alhambra palace is a magnificent fortress overlooking the city of Granada. In this walled complex, you can check out the Nasrid palace, various gardens, and the old military citadel, called the Alcazaba. Red-clay structures give the site an extraordinary and very distinctive look. Together, the Alhambra and the Generalife gardens (adjacent to the complex) have been designated a UNESCO World Heritage site. These are two can’t miss attractions! Mijas is undoubtedly one of the most beautiful white-washed villages in all of Andalusia. In this town nestled between land and sea, you can travel on foot or by donkey (burro taxi) through charming lime-whitened side streets, then cool off in the lower part of the town by taking a dip in the sea. A beautiful place with something for the whole family! When you pass through Catalonia, take some time to lose yourself in Girona’s stunning Jewish Quarter. You’ll find yourself dropped right into the Middle Ages as you walk this labyrinth of narrow streets and courtyards, Europe’s largest and best-preserved example of Jewish architectural heritage. Madrid’s lungs, spread out over more than 118 hectares, are a green oasis once reserved for the Spanish royal family. Take some time to wander through the park, have a picnic, or even rent a boat to go out on the lake and admire the majestic Alfonso XII monument. It’s not just pretty coves, clear waters, and trees bearing lemons, oranges, and almonds that you’ll find here: you can also have some seaside fun and enjoy the sunshine year round! Of course, a trip to Ibiza wouldn’t be complete without checking out one of its wild parties! Valencia, Spain’s third-largest city, tempts countless visitors with its beautiful weather, beaches, and cultural attractions. Here’s a tip: try to go there in the spring. We hear the streets are especially pretty when the flowers are in bloom! The Hotel Inglaterra is easily one of the most beautiful spots for admiring Seville by night. Have a drink on the hotel’s terrace and enjoy some fresh air and a spectacular view of La Giralda and the Cathedral. In the province of La Rioja, wine is much more than a drink; it’s a culture to be shared. With more than 60,000 hectares of grapevines and more than 1,200 wine producers, the region boasts some great vintages. For a gourmet experience, try a wine and food tasting at one of the area’s many wine cellars. Opened in 1997 and specializing in local dishes, this restaurant is known for its huge selection of beers and tapas. It’s well worth the trip, even though the wait times can get long. Even the locals eat here!